The past few months have been a bit of a struggle for me. I am not sure if it is an identity crisis, mid-life crisis, spiritual warfare or all of the above. But thanks to some good life long friends and text therapy, I finally think I have had a breakthrough. I have a hard time sharing my struggles publicly because I am used to being the “strong” one. I am not sure how that persona ever got started but it seems to be the role I have “played” best lately. I told a friend a few weeks ago that I felt like none of the people in my current day-to-day life knew me for the first 20 years of my life and vice versa (family not included). What I haven’t shared very often (that I remember, anyway) is that as a teenager I became convinced that I was going to die in a car accident before I turned 30 years old. As each new year brought me closer and closer to that age, I began to wander what life was going to be like without me. As a teenager I imagined all the bullies would finally feel bad for the all the tears I had cried over their words or perhaps one of the boys I had crushed on would finally stand at my casket and admit his undying love for me and how he would never love another – bit dramatic, ya think? Now you know where my kids get it from. As I moved into my 20s I had children to raise and love and try not to destroy and even one to be held for two weeks straight until it was her time to be called back to Heaven. God worked amazing details during that time in November of 1993 but that’s better saved for a different time. I am pretty sure I chose to ignore many of the dangerous situations I allowed myself and my girls to be put in. Perhaps I had that underlying death wish guiding my way or perhaps God was directing my misguided steps to lead me to a new life. 30 seems to be an important number for me. As the idea of dying started to fade, I started to make deals with God, such as “if I am not married by the time I am 30, I am never going to be married again.” – haha! good joke! I know without a doubt that God sent Andy to me just a few months shy of my 30th birthday. And I know without a doubt that God orchestrated things in such a crazy way that would find us married 2 days after I turned 30. I don’t know how God found any man in this world that could put up and be so in love with the crazy that is bottled up inside this 5’2″ brown-eyed girl – but he did and I am ever so thankful! Our 18 years together have not been perfect but I remain convinced that God sent Andy to save me from my self-destruction and I know he is perfect for me! Through some text therapy with a dear friend (one whom I have known over 30 years) I finally felt a break through. She didn’t say anything I didn’t already know. She just said things in a way that only she could that had me crying and laughing and not feeling guilty or shamed for the things we remembered from all those years ago. I slept so peacefully for so many hours and woke up with a smile on my face and laughter still bubbling from my soul. In some ways, maybe I did die before or as I turned 30. I am not the girl I once was but I want to be allowed to remember her with laughter and not shame, or sadness or tears. I want to put aside all the pretenses of being a grown up and responsible adult every now and then. Because as my friend pointed out last night those years before 30 had a LOT of hard times but I was surrounded by an amazing close-knit group of friends and it is that feeling of acceptance that I think I miss the most. Adult friendship is hard and it’s different and it is far more lonely than I think anyone wants to admit. We are busy in our roles of wives, mothers, grandmothers, employees, bill payers, house cleaners, and so on and so forth. and so very few us take the time to make our friends a priority. Somehow society has told us that if we spend too much time on ourselves or our friends than we are selfish and this diminishes our chances at wife or mother of the year. And many times, I think that we are just so tired of trying to be everything for everyone that it is all we can do to drop into bed at night and then lay there thinking of what the best school lunch menu days were or remembering that one time “when the lights went out in Jackson”. And then we shame ourselves because that was long ago and far away and my thoughts should be on the blessing God has bestowed on me today and how I can love better and serve better and mother better and just be better…and we wake up exhausted and do it all over again forgetting why we walked into the kitchen or where our phone is while it is in our hands. y’all, I love Jesus and I love God’s Word if you know me at all – you know this to be true. But somewhere inside of me is a barefoot, big haired girl who misses driving down dirt roads with the sun beating down, windows down, music full blast and forgetting about the cares of day-to-day life. I still struggle to find a middle ground, but I think I can and I think God will approve. I suppose a part of me did die when I turned 30 and this life after 30 (closer to 50 now) is my best life but I wouldn’t have gotten here without those dreams and memories and people who came before. So I wont let Satan lie to me anymore. I will laugh when things are funny whether they occurred in 1987 or 2019. I will cry when the memories reach a tender spot in my soul. I will reach out more to the people who have always played an important role in my life and I will make it a priority to spend time with them beyond the “let’s get together for lunch someday” – and then someday never comes. Will you join me in 2019, with windows down, music up and barefoot feet upon the dash? Life is a wild ride but let’s vow to find the joy in everyday! I have been praying that God would give me something to share and He never fails!! Reading today in Mark 3:23-27. One only has to open social media or turn on the news to see how divided out nation has become and this trickles down to effect our states, our cities, our Churches and our families. There is a lot of talk about staying United. Yet everyone has their own idea on what that looks like and while we scream for acceptance and tolerance… we, ourselves, are often not very tolerant of those who are not the “same” as us. Yesterday I was watching Netflix with my teenager. And it was like going to church; such a lesson on love. Sharing Jesus and loving unconditionally. How can we ever stand together against the forces of evil when we are so busy pointing out what we see as sin, posting disrespectful comments about our leadership or those who do not think the same way we think they ought to??? The notes for Mark 3:23-27 refer to the “strong man” as Satan. We must tie him up with love. Unconditional love for each other. Being United in love is the only way our families will be strong. In order to change the world, we have to start small and like a spark (it only takes a spark…sorry had to stop and sing my favorite church campfire song) those flames of love will spread. Love conquers all! Who can you show love to today? And how will you do it? I would love to hear about it! Be well! Dwell with God! In His Word and with His people! I was so excited to see answers in God’s Word moments after I journaled a prayer in my Awaken by Priscilla Shirer journal. I wanted to do a live video to share about it. But…it’s HOT and I didn’t think anyone needed to see me sweating and squinting in the sunshine. For those of you who have followed along or heard my ramblings this year, again I am being reminded about being obedient and the blessings that follow. I had selected the word “purpose” to focus on this year but it seems God had other plans. 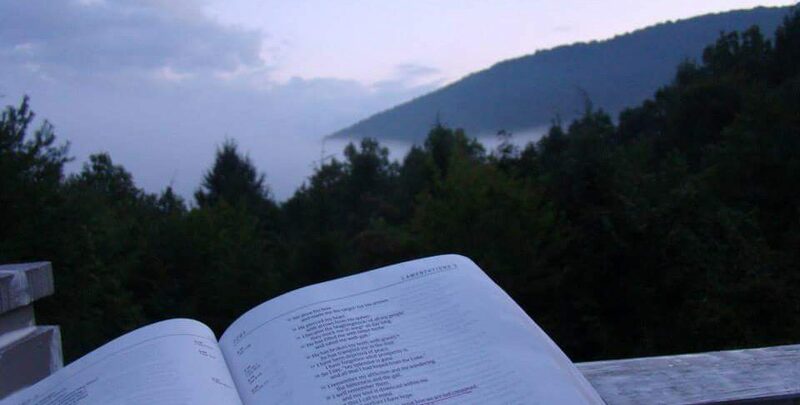 To begin my few moments of quiet before the children or grandchildren found me, I was reading Matthew Chapter 4 and I underlined verses 19-20 in my bible. This is where Jesus tells Simon Peter and Andrew “Follow me and I will make you fishers of men.” The Bible tells us immediately they dropped their nets and followed him. I know I have touched on this before but today I also noted how they did not ask questions, they did not wonder how they were going to eat or have necessities. They did not worry about how they were going to provide for their families. They simply listened and followed him. This sums up so many of the lessons I have already been learning this year. Listen to hear, be obedient, share with others, be blessed! While there are days of doubts, days when I don’t give my best to anyone, I still move on- small steps at a time. Listening for the Lord, sharing his word and being blessed when what is written here touches the lives of one of you. I guess that’s why your feedback is so important to me. It encourages my soul and my obedience with blessings that I am able to see here and now because I know God’s plans include blessings for others that I will never know about on this side of Heaven. Dwell in Him, In His Word, With His People! Are you living in the freedom of Christ? Do you ever get tired of the “oh woes me” self-help books, tweets, snaps and posts that seem to inundate your news feed? Please understand I do not think I have it all together. I do think those tools are useful. I just think sometimes we focus so much on our worldly shortcomings that when we go through seasons of goodness- it is kind of hard to enjoy it. I stop to question, am I really at peace right now? Did I really enjoy a half hour of silence soaking up the sun (yes I am an 80s girl who still likes laying out)? Shouldn’t I be trying to figure out where my shortcomings are and what is wrong with me today? Shouldn’t I be spending more time in God’s Word or serving His people or Shouldn’t I be sharing some intelligent new thought on Christian life that no one else has shared before??? There are a lot of shouldn’t I’s we could listen to. There are lots of resources for our sinfulness, our loneliness, our anger, our sadness, our past mistakes, our comparisons, our need to seek Him more. Of course, the best of those resources is just simply His Word itself. Studying God’s Word convicts me, calms me, gives me joy and reminds me that I am loved. And sometimes I don’t need to be reminded. Some days I just know! I feel Him near, I see Him moving in my life and life is just good! So let’s not be afraid to celebrate the good days. Let’s not be waiting for the next shoe to drop. Let’s just enjoy a sunny Saturday knowing that God loves us. He has claimed me worthy as one of His own. He has called me to His Kingdom and so no matter what this life brings I ALWAYS have something to look forward to. Today I declare that the end goal is worth it and it is enough for me just for today! Today I am soaking up the Son! Today I am being thankful and praising Him for all of His Blessings – bc I am His and He says I deserve it! He chose me and I choose Him, today and Always! Go out and enjoy your weekend. Celebrate like you are royalty because you are! You are the child of the King of all Kings! And nothing can ever take that away! Dwell with the King today, Dwell in the King’s Word, Dwell with the King’s People and Be well! !